wordless wednesday: baby dove | i made it so. what a great closeup Ana! 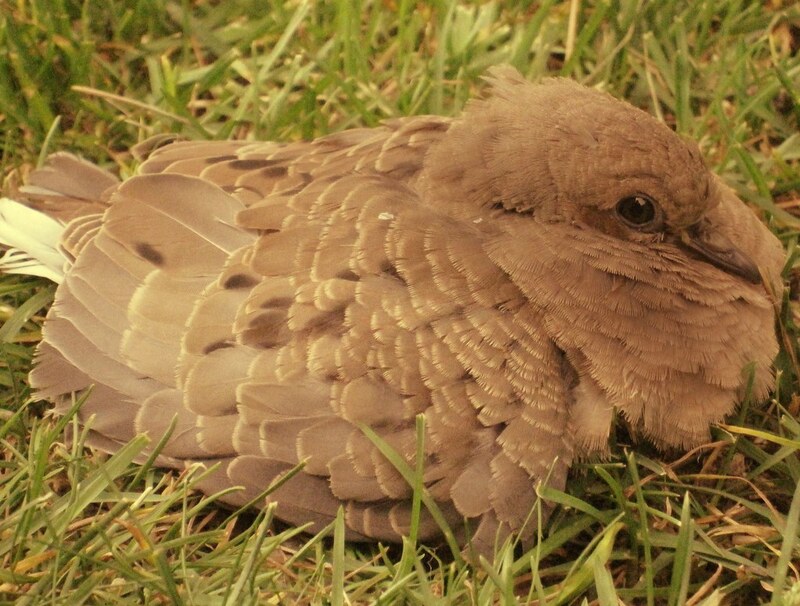 this one has a little story, but i’ll share it here since it’s wordless up there ;) it was a little baby dove that we found flitting about in the grass. i don’t know where the doves nest but this one was out of its element and looking stressed out. it had a little limp too so i wasn’t sure if it had hurt its leg. anyway, over the next few days, we saw it try fluttering around to different parts of the yard. on a few occasions, we saw it being fed by the mom (or maybe dad? not sure about dove behaviour) so at least it was being cared for. last week, i saw it fly up onto some low bushes, so i think it will be ok. cute lil thing though, especially in its earliest days. yes, lots of wildlife around here too. happy summer to you as well patty! Very sweet picture (and story!). So glad it has a happy ending. :) We had a baby do e land on our boat in the driveway while we were doing yardwork, and it was so cool. It wasn’t afraid of us, and met us stand close (ish) to look at it…babies of all sorts are so sweet!